Though it's been around since the Middle Ages, the sewer system beneath Paris won fame in the 19th century, when the city offered boat tours through the tunnels. This is also when an ingenious method for cleaning clogged tunnels was devised. It involves giant balls of iron and a lot of velocity. 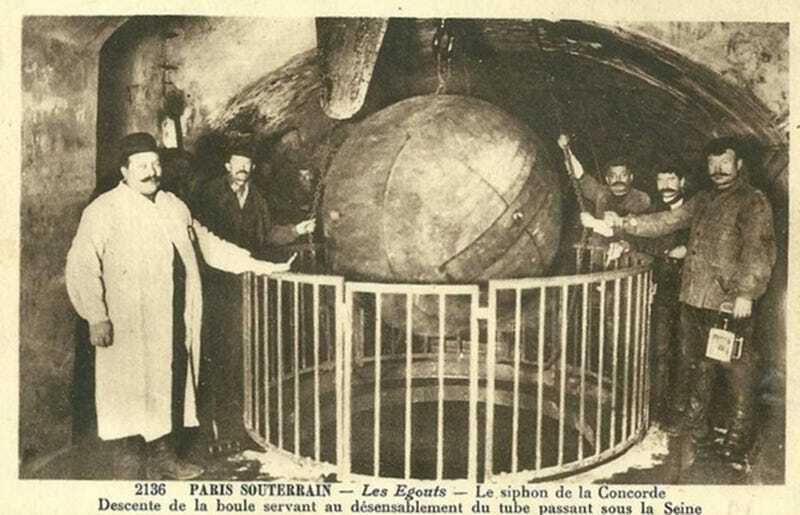 Put simply, Paris unclogs its sewers by sending these massive "boules de curage" hurtling through the tunnels. The orbs, which measure 10 to 15 feet in diameter, slam into the refuse, knock it free, and restore the flow. It's not unlike the way that drain snakes unclog your sink at home. The boules have been doing this work since the 1850s, when Paris modernized its sewage system under the tutelage of engineer Eugène Belgrand. City-sponsored tours during the Exhibition of 1867 showed off state-of-the art system at work in Paris, though we can only assume that demonstrations of the giant rolling iron balls were reserved for times when the tunnels were empty of visitors.